The last few weeks have been momentous ones in my life. They have proven to me that - beyond a shadow of a doubt - I can do anything that I set my mind to. Because two weeks ago, I closed on my new house. I bought a house. And I did it on my own. It was terrifying...and exhilarating. It was nerve wracking...and thrilling. Although buying a house isn't something that I'd never done before, the last time I did it, I was married. And having that other person involved in the process made it less scary somehow. The house we owned previously was in Massachusetts. We purchased it at the height of the market in 2007 just before the crash. After the economy went south, we held on to the house as long as we could and finally sold it at the end of 2009. We took a loss...but thankfully, not a huge one. And then we moved back to Utah. Our plan was to rent, save up enough money for a new down payment, and purchase another house. But then in August of 2010, John was in a terrible car accident that almost claimed his life. He was unable to work. The job that I had been working in Massachusetts had allowed me to telecommute, and I had continued working it after we moved to Utah. But it was a contracted position, and ironically, the end date fell the day after John's terrible accident. We lived off my retirement savings until it was depleted. And then, unexpectedly, the people we were renting our house from, decided to sell it. We were obviously in no position to buy it. But luckily, we had family who had a townhouse available for us to rent. It was in a town 45 minutes south of where we were living, but we were thankful and moved in. That little townhouse was such a blessing. They let me paint it and decorate it how I saw fit. The neighborhood was wonderful. The kids' schools were wonderful. My personal life was rocky during the three years we lived there, however, and last year, John and I separated. Our divorce was finalized earlier this year. It was obviously a very difficult time for my children as well. I longed to give them stability. I lived in the same house my entire childhood. My parents still live in that house today. That house is still a home base of sorts for me. I wanted my children to have that as well. I wanted to give them a place that they could remember as their childhood home. I wanted a place where we could build wonderful memories. I hoped for a place that would be filled with memories they can someday share with their own children. I started working as an interior designer for a home builder. Things started to look up. 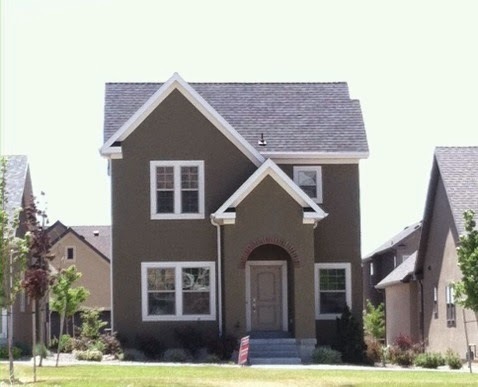 And then, I found a wonderful job working as an interior designer for Ivory Homes, the largest home builder here in Utah, and for the first time, in a long time, our family was doing well from a financial standpoint. So although it was scary....terrifying actually...I took the leap and bought a home. It was a quick-move-in home from Ivory. It is in the same area as the little townhouse. My kids get to attend the same schools and live near their friends. The house is not huge. But it's perfect. Our little family of five fits perfectly. My children feel invested in this home. They love it already. I love it for lots of reasons, but mostly because of what it symbolizes. 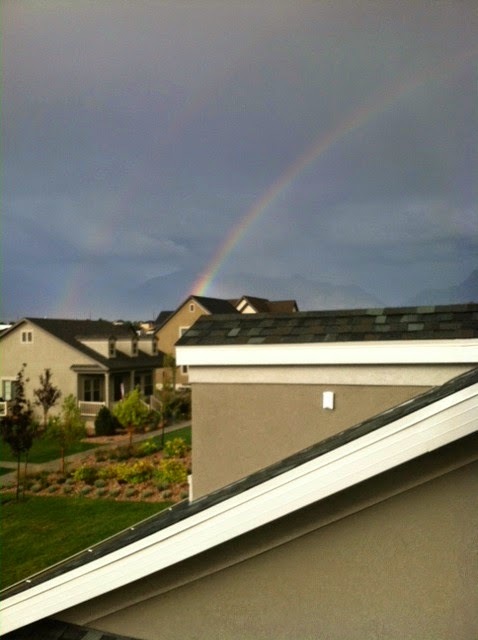 The view out my master bedroom window the day we moved in...a good sign. It is undeniably a blessing. It is also a gift. It is a gift to myself. It is a gift to my children. We have named it Hydeaway Cottage. Of course, the name is a play on words since our last name is Hyde...but it is also symbolic of the fact that this home is our retreat - our safe haven. To be honest, I am no less scared than I was before. Being single and having the responsibility of a house is, quite honestly, terrifying. But I know I can do this because if I've learned anything during these past few years, I've learned that I'm brave. And that counts for a lot. Awesome! Good for you! I'm sure you will make it amazing! How fabulous. Good for you and congratulations!!! Stepping out on your own is a scary thing, but you have conquered your fears and that is a super milestone. Can't wait to see more. Being brave counts for SO MUCH! I'm so glad for you, Wendy. I'm proud of the way you're making a home for yourself and your kids. Even though life has thrown you a tremendous curve ball, you're hitting it out of the park. Way to go! Congrats and YEAH! to you! I purchased my Little Bitty Damn Houze by myself after being married 25 years and then divorced! It was scary but liberating. And I love it!! Congradulations! You can do this! Congratulations! I have been through a divorce and I know how hard it is for both you and the children. I am happy for you, and the house looks adorable! Good for you! The scary part is behind you now, just focus on taking things one day at a time. There's nothing you can't do! Congratulations Wendy! There has been a lot of change in your life these last few years, and you've handled it beautifully. You're also living the true meaning of courage: It isn't that you feel no fear, it's that you experience the fear and do what you need to do anyway! Congratulations! You are a brave woman, so just keep believing in yourself! Congratulations! What a wonderful role model you are for your children. Way to go, girl! Congrats! Best wishes for many happy memories there! About a year and a half after Sara (my baby) got married, I met my wonderful new husband (who was a widower). He was so worth the wait! I pinch myself everyday since our marriage almost two years ago. He has brought me so much happiness. Again, wishing you the best, Wendy. I know you'll be successful at whatever you do. Congratulations and best wishes in your new home! It's beautiful! Congratulations on your new home. I think the rainbow was a wonderful indication of how happy you will all be in your new home. Enjoy. Congratulations on the new home! I'm very excited for you. I bought my first home by myself and it was frightening, but it was awesome too. It was actually in SLC too, across the street from Sugar House park. All the best & thanks for hosting! A huge congratulations - I was a single Mom for 10 years so I know what an accomplishment this is! Isn't it amazing what we can accomplish when we truly believe in ourselves? Congratulations and best of luck with this latest adventure!! Congrats Wendy! It looks adorable. It looks a lot like Daybreak, but you said you stayed in the same neighborhood right? So that can't be it. I was gonna say, hey we are neighbors!! What a wonderful blog post first thing this morning! Thank you so much for sharing your thoughts and hopes. I don't know you personally, but I am so proud of you! Congratulations lady! I am SO proud of you and your accomplishments. You rock!